What possible crime could be more heinous and threatening to public safety than a woman who forgot to swipe her bus pass? It is a scourge on our society. We must root it out and brutalize offenders in a very public way so as to discourage future criminal acts. I plan to write a letter to the City of Belgrade protesting the arrest of this woman. If the point of her arrest was to demonstrate the power of the police and the weak position of our citizenry, then jail is NOT the answer. 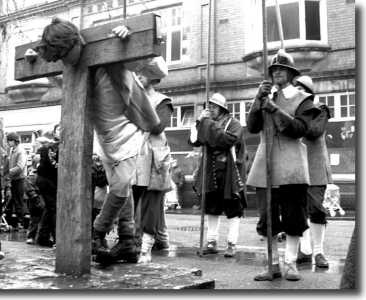 The answer is a public pillory. She should have been displayed in the middle of Trg Republika in the stocks so that people could ridicule her and launch rotten tomatoes at her fare-skipping face. How dare this woman (who has not yet been named publically but we will soon ferret out her identity – after all, failing to produce her ID card was part of her dastardly crime) flaunt the majesty of our bus system? But we are MUCH too soft on this kind of villain. When the City went after the citizen who filmed the woman’s arrest, the idea was to cover up the police action. This is a mistake: it should be broadcast on every television and social media channel. And we should not stop there! Every day in the White City people are jay-walking, driving in the wrong lane, and failing to come to a complete stop on a yellow light. We need to make examples of these scofflaws, to humiliate them and make sure that the general public truly understands that that State must be obeyed in all things. Didn’t pay your parking ticket? Missed a spot while shaving? The stocks await you! And while we are at it, what about the people who dare speak against the Government? Do they have some special immunity from punishment? Indeed NOT! I am talking about those people who use the public forums like evil blogs to write unspeakable things about a Government that only ever has our best interests at heart. If we do not take these drastic measures, the people will soon begin thinking they have Rights. They will take to the streets! They will gather in public places! They will want things like Due Process and Proportionate Response. They may even think that they can decide for whom to vote all by themselves. After that, it is only a short leap to Accountability and Responsibility. As responsible citizens, we should all go to the police now to surrender. This entry was posted in Essays and tagged arrest, B92, Belgrade, bus, BusPlus, Chris Farmer, citizens, expression, media, police, responsibility, rights, Serbia, The Standard Deviation. Bookmark the permalink.